The Portuguese have had an impact on the way Asians cook. This can be seen as early as the early 16th century when the Portuguese went abroad from Malaysia to nearby Thailand, then known as Siam. 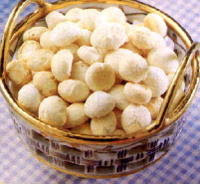 The Portuguese influenced an unexpected aspect of Thai cuisine: its sweets. By introducing the concept of using egg yolks and flour, ingredients integral to Portuguese dessert making, the Portuguese had an impact on Thai desserts that exists until today. Real traditional Thai desserts contains only three main ingredients : flour, sugar and coconut. These three are mixed in different amounts and cooked by various methods such as bolling, frying, streaming, and grilling, to produce nummerous kinds of desserts. Almost 1,000 different desserts have been invented from only 3 main ingredients displaying great imagination and perseverance on the part of the Thai people. Heat the coconut milk, sugar and egg yolk in a saucepan over medium heat and simmer it until it thickens slightly. Let it cool down. Add flour to the coconut milk and mix well until combined. Turn onto a lightly floured board and knead until smooth. Cover and let rest for 8 to 10 hours. Preheat oven to 325 degrees. Grease baking sheets or line with parchment paper. Cut dough into rounds or roll into small balls and place on baking sheets. Bake until the bottoms are lightly browned and the tops are still pale. Remove from baking sheets and cool in wire racks. oooooh! This looks terrific! Love Thai!